After an injury, Teal'c must put aside his self-doubt when SG-1 launches a mission to rescue his son and his mentor from a Jaffa death camp. SG-1 returns to Stargate Command under heavy fire with Jaffa so close behind one makes it into the Gate Room. Weapons fire is exchanged through the wormhole. To everyone’s horror, Teal’c is shot in the abdomen by a staff weapon blast. He no longer carries a symbiote, but has spinal damage. He will have to recover normally and complete physical therapy with the help of the new drug, tretonin. Though Daniel returned from his time as an ascended being with a memory wipe, he is able to get glimpses into that period. During Teal’c’s convalescence, Daniel is plagued with thoughts of Rya’c, Teal’c’s son. Disturbed, he begins to get visions and hears Rya’c’s voice calling out. Daniel asks Carter to review the logs of incoming wormholes, looking for any kind of anomaly. His own self-doubts mirror Teal’c’s, wondering why he came back from being ascended. He begins to think he needed to do something, but he can’t remember what it was. After a period of recovery, Dr. Janet Fraiser feels Teal’c is fit for duty. Mentally, he does not believe he is ready, thinking he is not as good a fighter as he was. For him, weakness is death — “kek.” Although the tretonin works fine for Teal’c, he obsesses that a real symbiote is what should sustain him. 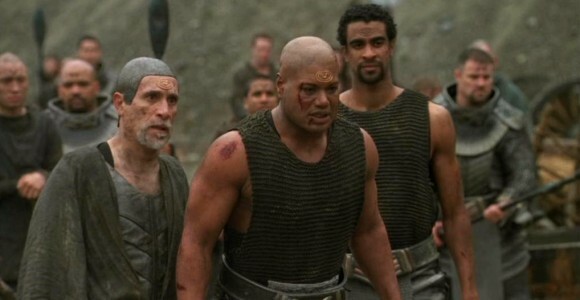 O’Neill realizes that, mentally, Teal’c is not prepared for duty. While meditating with Teal’c, Daniel has another vision of Rya’c in a Jaffa version of a concentration camp. In the dream, Bra’tac takes a lashing to protect Rya’c. Daniel reveals the vision to Teal’c who admits having “seen” Daniel while dying in an ambush last year. Because of this incident, Teal’c is more willing to believe Daniel’s vision. They take the matter to General Hammond, who orders a rescue attempt (if the location can be determined). Rya’c and Bra’tac have indeed been captured. They are being worked to death in a toxic naquadah purification facility. Bra’tac has run out of tretonin and is dying. He hides the truth from Rya’c, but the young Jaffa knows. Back on Earth, Daniel’s visions continue. Rak’nor is called in for consultation and determines the planet is Erebus, a place for condemned souls. But there will be a problem reaching it: the Erebus Stargate has a forcefield. Daniel flashes back to witnessing Bra’tac sending a coded signal through an outgoing wormhole. Sam realizes what that means and finds the log entry and the code in the Alpha Site records. Having the deactivation code to the shield on Erebus, Hammond approves the rescue mission, putting O’Neill in charge. The rescue is none too soon. SG-1 and SG-3 make it through the Stargate with Rak’nor. O’Neill assesses the situation. It is a harsh and dreadful encampment. Cruelty rules and executions are commonplace. O’Neill agrees to allow Teal’c and Rak’nor to infiltrate the encampment after dark to make the extraction. In a tent, Teal’c finds Bra’tac near death and administers additional tretonin. Bra’tac is so far gone he can’t move immediately. The two Jaffa are discovered. Helplessly, O’Neill watches the guards whip Teal’c through the night. Against his team’s objections, O’Neill lets it happen, unwilling to reveal the presence of backup. They need a new plan — a distraction. O’Neill looks to a partially constructed Ha’tak ship floating above the encampment. The new plan is to blow it up as a diversion. Sam and Daniel ring up to the ship to plant C-4 explosives. Down below, in light of his apprentice’s recent injury, Bra’tac gives Teal’c a needed pep talk. Trying to spread the news of a rescue, Rya’c is discovered and sent to be executed. O’Neill radios Carter, instructing her to hurry. Teal’c approaches the guard and asks to take Rya’c’s place for execution. Carter detonates the ship, which gradually falls from the sky. The Jaffa guards run to try to deal with the situation and get mowed down by S.G.C. forces. Teal’c and his would-be executioner fight one-on-one. Though Rya’c wants to intervene, Bra’tac prevents him, knowing Teal’c must prevail himself or continue to live with doubt. Eventually, Teal’c prevails by himself. A fight ensues as the prisoners take up arms, and it is not long before the camp is liberated. Back at the S.G.C., Daniel joins Teal’c for a period of meditation. Both men have been restored in their own ways by the Erebus mission. Daniel confesses that he now knows where he belongs. And why. In Greek mythology, Orpheus was the greatest of musicians and poets. His story does not bode well for allusions to Teal’c’s situation in this episode: Orpheus went into the underworld to retrieve his dead wife, Eurydice. Hades granted him permission to do so, on the sole condition that he did not look back as he was bringing her to the surface. Just before they arrived at the upper world, Orpheus looked back, and she slipped back into the underworld. Read more at the Encyclopedia Mythica. “Not to be confused with [Season Ten’s] ‘Morpheus,’ ‘Orpheus’ is another Peter DeLuise extravaganza. You can always recognize Peter’s episode because they always contained one of three things: Unas, noble Jaffa, and/or explosions. VOTE! How would you rate SG-1's "Orpheus?"